Bishop Buckley performs the Rite of Commendation for Sr Thérèse Marie O’Connell with Fr Robert McCabe. 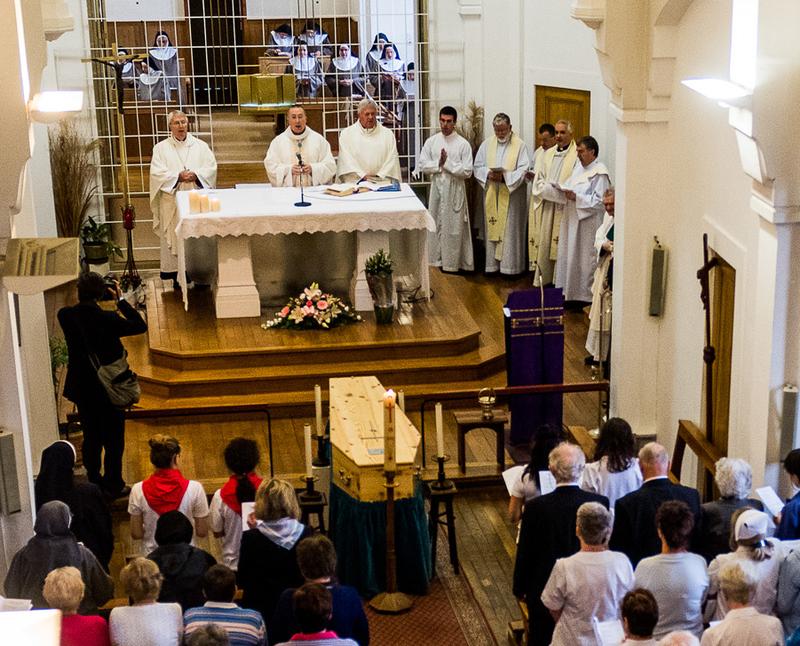 Tributes have been flowing in for Cork-born Sr Thérèse Marie O’Connell who lived out her religious vocation in the heart of Lourdes for over fifty-seven years. 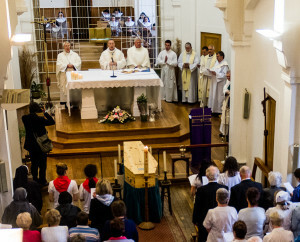 News of her death coincided with the Cork & Ross pilgrimage to the French shrine and it enabled a large contingent from her native city to attend her requiem Mass at the Poor Clare monastery at the French shrine. 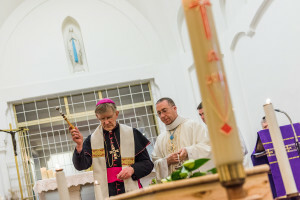 Mourners from Ireland were led by Bishop John Buckley who presided at the funeral Mass and led the Prayers of Commendation, as well as Bishop Patrick O’Donoghue, priests and pilgrims from Cork & Ross and Fr Robert McCabe of the diocese of Meath. Sr Thérèse Marie’s family, siblings Dan and Gretta, were unable to make the journey from Cork to Lourdes due to ill health. 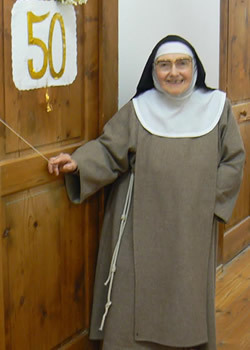 In 1958, as a 35-year-old, Mary Teresa O’Connell responded to God’s invitation and made the “cross over” from rue de la Grotte where she worked in a souvenir shop to become a postulant and novice at the Poor Clare monastery. Sr Thérèse Marie O’Connell who lived out her religious vocation in the heart of Lourdes for over fifty-seven years. “She hardly expected that her change of life would involve 57 years of living out her vocation here in this community,” Fr McCabe commented. 1958 was also the first year of the International Military Pilgrimage to Lourdes and Fr McCabe, a Chaplain to the Irish Forces, said Sr Thérèse Marie spent each month of May looking forward to hearing the bagpipes and receiving visits from Irish military personnel. Fr McCabe also noted the happy coincidence of the Irish nun’s funeral taking place on the Feast of the Immaculate Heart of Mary and near the place where Our Lady revealed her title ‘Immaculate Conception’ to the young Bernadette Soubirous. 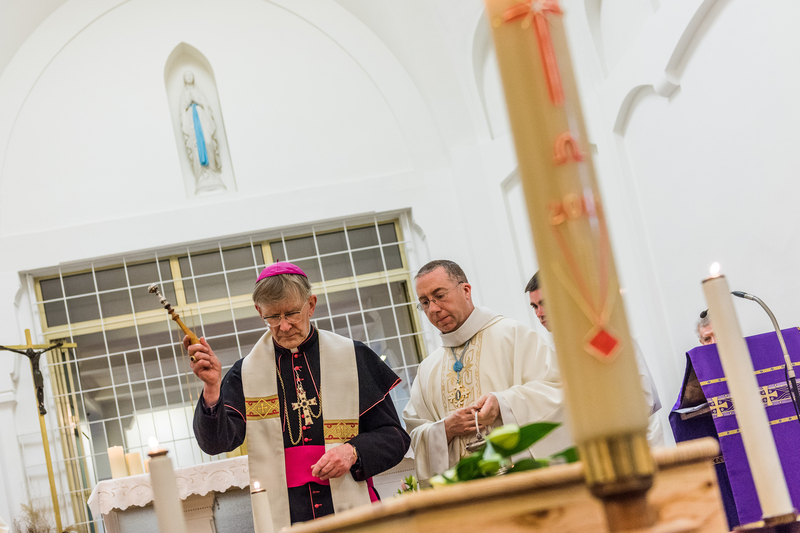 “Today is also a day on which the doors of Franciscan and Poor Clare monasteries are open to all who celebrate another role model– the one who helps us to find so many things – St Anthony of Padua!” he said. In his homily, Fr McCabe said it was a day on which to thank God for Sr Thérèse Marie parents and all the O’Connell family, her onetime souvenir shop colleagues in Lourdes and the Poor Clare Community who encouraged her as she discerned her vocation in her mid-thirties. “Thérèse Marie never lost her Cork accent! Her voice and tones have become familiar to so many people in various cadences of the French language,” he recalled. All who visited the parlour of the Poor Clare convent knew that they would be met by someone who would listen to us with her ears, her eyes and her heart. He also prayed that “many more women and men from Inis Fáil will answer God’s call to joyful and faithful service in the consecrated life”.